The Great God Pan Is Dead: How Many Artists in Houston Teach Art at Community College? 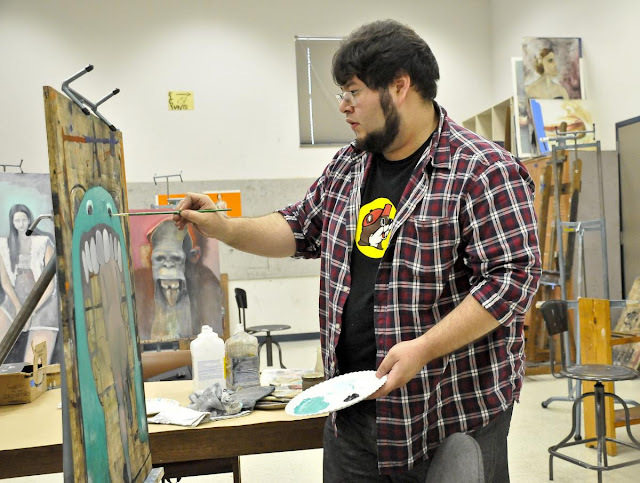 How Many Artists in Houston Teach Art at Community College? 4) How long have you been teaching? 5) What course(s) do you teach? Feel free to answer in the comments, or if you'd like your response to be private, you can email it to me at robertwboyd2020@yahoo.com. My gut feeling is that the various local community colleges (HCC, Lonestar, San Jacinto, etc.) provide jobs for a lot of local artists. Also, it strikes me that this is one area where Houston artists have contact with working class people. This has been on my mind a bit because I'm in the middle of reading 9.5 Theses on Art and Class by Ben Davis. I suspect that this intersection of middle class artists and working class students is an interesting one, and I'd like to know more. So if you teach art in a local community college, please fill out my poll. San Jacinto College art student Oscar Perez. Photo credit: Andrea Vasquez, San Jacinto College marketing department. Been teaching since graduation in 2007. Was adjuncting at UH and multiple HCC campuses until landing at San Jac. Primarily teach classes in Digital Art (Photoshop) and Web Page Design. I am in charge of the Art and Design Technical program, which while being a component of the Fine Arts department, resides in a building on the opposite side of campus. My previous career as a designer helped me land this job just as much as my MFA credentials. I've got your back Robert. Plus, I just favify-ed this page. Good times, that! If you are looking for the past as well, did a three year stint at HHC Central in sculpture and art appreciation and one year at HCC SouthEast in art appreciation following three years at ALH in advanced perspective for architects, 1/2 year at HSPVA in drawing and about five years at Glassell in various drawing classes. All adjunct because David Brauer said it was my responsibility to share a few hours weekly about what being a full time artist thought. Hope Michael Golden and Scott Cruthers at HCC Central respond. I worked a couple of years at Laguna Gloria in Austin, two at the Art Institute of Houston, moved to NYC and taught at AI NYC for three years. Moved home to Houston and taught for another couple of years at AI. Switched to Lone Star CC for about a year and a half. All the jobs were adjunct. Taught a wide variety of 2D first-year courses (drawing, composition, color theory, etc) and also some fashion sketching at At the Art Institute.